I never expected to come back from Lanzarote with a yearning to create. Indeed, I can’t think of any other occasion when my expectations of a place have been so totally reversed, thanks in the main, to the place we stayed. Lanzarote Retreats is an eco hideaway, almost concealed from view from the beach of nearby fishing village, Arrieta, just minutes’ walk away, on the remote north coast of the island. Just a few elegant palm trees mark the spot of the finca, or farm, where Michelle and Tila Braddock, of UK origins, but living on the island for the last twenty years, have not only mastered a collection of eco designs, but also created an exemplary flagship of what sustainable, rural tourism can and should be. The finca boasts seven yurts and a handful of cleverly restored stone and wooden buildings, including a stunningly romantic, converted water tower, an about to be completed eco barn, all powered by forty solar panels and two wind turbines, with spring sourced water and a grey water recycling system. The small community revolves around a communal, solar heated pool area in the restored farm reservoir, with an honesty shop built over a disused well, now housing everything from locally sourced water melons and bread to local wine. They now have the only electric car on the island, a very cool lunar looking mobile which they power using their solar panels. Click here for a photo of Twizy getting solar sustenance. What’s more the local wine is good – another thing you wouldn’t expect from a place which is notorious for being grotty not green. There are wineries, or bodegas, spread throughout the heart of this volcanic island, with La Geria valley covered in thousands of craters dug into black sand, each home to an individual vine surrounded by a stone wall to protect it from the island’s almost constant, and welcome, wind, so that they can thrive in this harsh environment. microcosm of this, with yurts mirroring the soft mounds of the island’s myriad volcanic cones, and the stone renovations a reminder of a local determination it to survive here following first eruptions in 1730. The general air of living life to the full at the finca, where chickens roam around freely and the much loved donkey, Molly, always brays a welcome, infused our holiday from the start. Although we had the use of a hybrid Toyota Prius, which came as part of our Eco Luxury Yurt package, Tila met us off the plane in his Prius, with a bottle of chilled bubbly in the boot to wash away any travel stress within minutes. Within minutes of arriving at their divine homestead, Tila had whisked our boys down the dusty path to the beach, complimentary body boards in hand, to show them where to catch the best waves. We sipped more bubbly, rifled through our pre-ordered box of local fruit and veg, and took in our sumptuous surroundings. 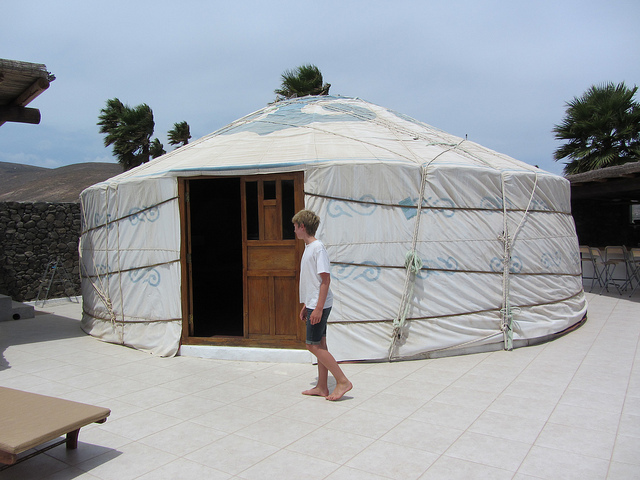 Our yurt was bigger than our home, with polished wooden flooring, swathes of fabric separating our bed from the kids’, a private terrace with daybed and dining area, an outdoor kitchen with a view of the sea, and a private bathroom with shower and wooden bath. All enclosed by the finca’s signature stone wall, with cleverly designed windows set into it, so you never lose sight of the sea and swaying palms. 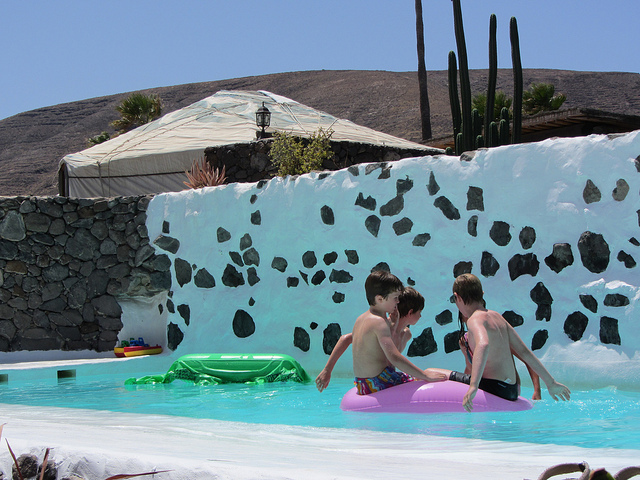 Lanzarote Retreats is not a product of the latest ‘glamping’ fashion, however. There are plenty of less ‘luxurious’ yurts on offer, still stunning, but with the use of a communal kitchen and shower, but with all the same gorgeous views and vibes. They are not trying to impose a glamorous retreat onto this quiet, rural spot, but simply letting their finca something organically and sustainably. The Braddocks have always been inspired by the Lanzarote’s visionary artist and architect, César Manrique, who worked closely with local authorities throughout the late 20th century to prevent his homeland from resort ruination, and whose many architectural masterpieces built into lava bubbles and caves we visited and adored. 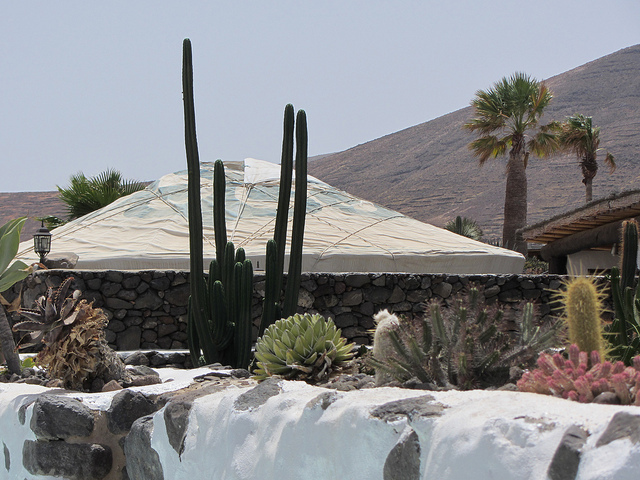 To visit Lanzarote without imbibing the creative juices of Manrique is like doing Barcelona without Gaudí. Manrique’s statue ‘El Diablo’ is the symbol of Lanzarote’s National Park of Timanfaya, and his restaurant is still at its heart, with meals still cooked using the volcano’s heat. Most tourists opt to tour the Park by bus or camel, but I avoided the tourist trail by trekking up Pico Partido volcano with expert local walking guide Marcelo Espino of Canary Trekking, one of a handful to have a walking permit within the Park. With superb geological knowledge, English and charm, he led us along dramatic lava flows, tunnels, craters and ridges, and finally up to the one of the best viewpoints of the island, where the geological magnificence was closer to my landscape expectations of Iceland than resort land. Like the wild figs which thrive in the volcanic desert, or the fecund vines which blossom out of their otherwise barren foothills, Lanzarote Retreats proffers colour and life. We jumped off the local pier with a bevy of screeching local kids. We took a boat out to the small nearby local island of La Graciosa, camped on one of its secluded beaches, barbecued freshly caught tuna from its tiny fish shop, and snorkelled along its reef. The boys surfed, we all swam and I saluted the sun in the finca’s yoga class. On the last day I went hiking with Michelle straight out of the finca, up through the Temisa Valley, onto a mountain path which led to the artisan craft market at Haria. On the way back we strolled into Haria’s cemetery where, hidden away, we found Manrique’s grave. Just a plain, engraved stone set into the ground, with a palm at one end and a cactus at the other it was, “Just as Manrique had requested”, the gardener told us. “It’s simple, natural beauty is really quite touching,” Michelle said and, as we strolled back down the side of the volcano, in quiet contemplation of the good things in life, I caught sight of her simple, natural creation among the palms far below, and smiled, thinking that her hero must surely be looking down on it and smiling too. This entry was posted in Articles and tagged eco Canaries, eco Canary Islands, eco Lanzarote, eco yurts, green Canaries, green Canary Islands, green family holidays, green Lanzarote, hiking Canary Islands, La Graciosa, Lanzarote, Lanzarote Retreats, yurt holidays Canary Islands. Bookmark the permalink.